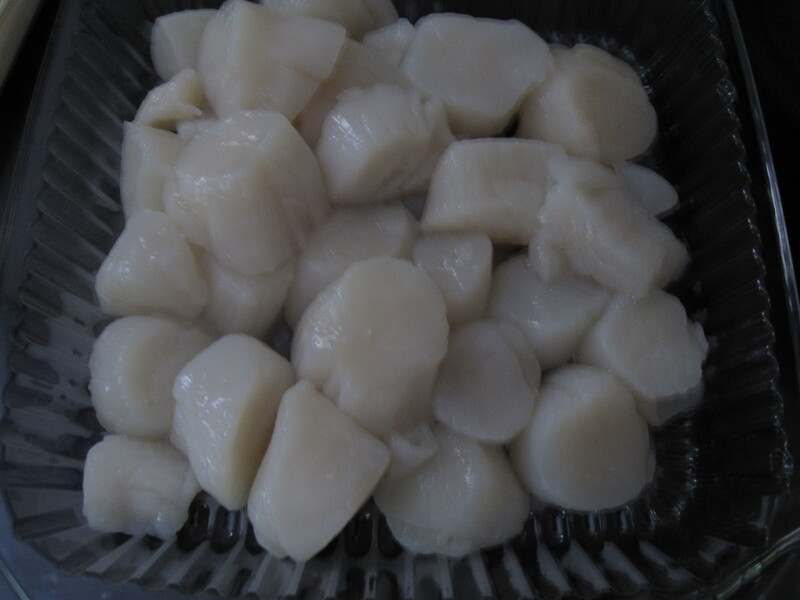 Scallops were on a great sale at Giant, $7.99 a pound for sea scallops down from the usual $10-$11 or even more so I got some but did not have a vision of what I was going to do with them. As you will notice we are big grillers, and being that it has been so hot recently I have been trying to keep most of the cooking to outside which led to grilling. I have tried to grill scallops right on the grill grate before, but that was a wasteful disaster. I have also grilled them in the grill basket, but it was not great. 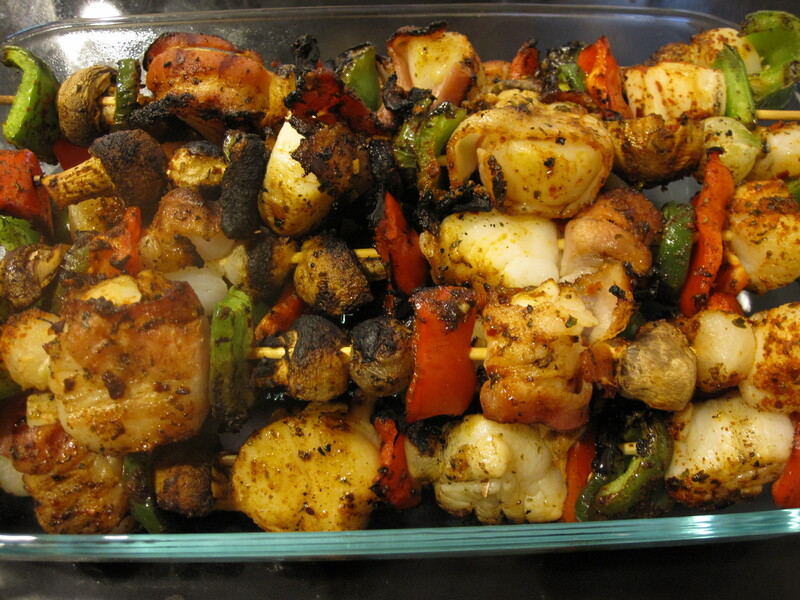 The only other grilling possibility seemed to be skewering, which I had never tried with scallops but was hopeful. 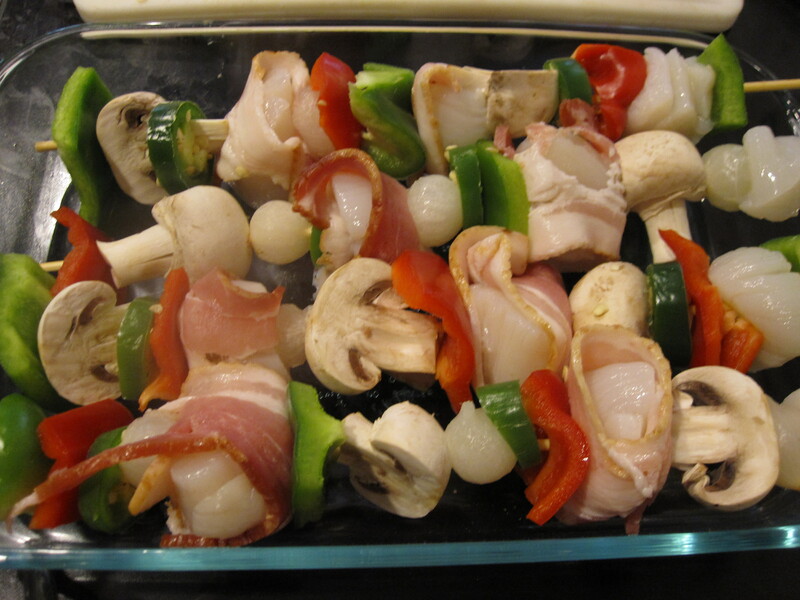 I decided to use a standard array of skewer vegetables, but also decided to fall upon the cliche garnish of bacon wrapping some of the scallops. I skewered everything in a somewhat random order on the bamboo skewers which were soaked in water to try to dissuade their burning which still occurs a bit. 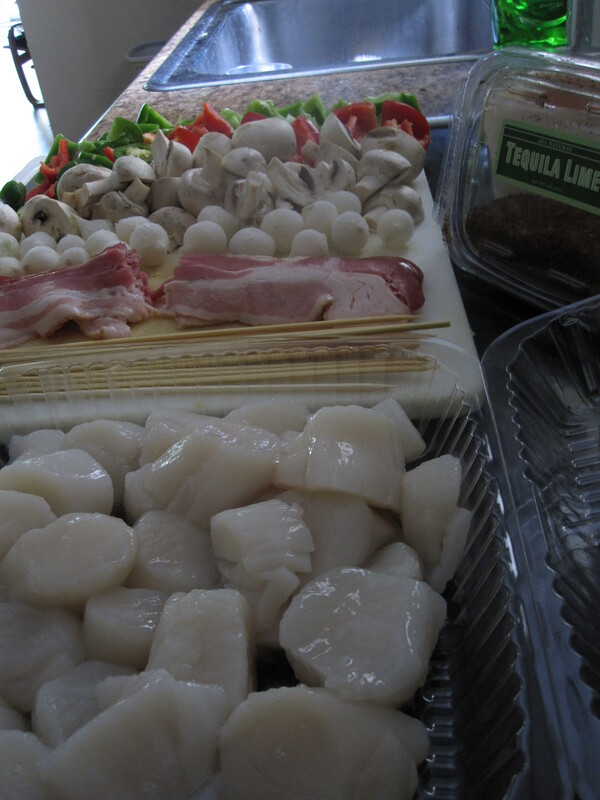 I cut the bacon in half and did not wrap every scallop as I wanted it to be an accessory and not a main ingredient. I didn’t want them to be bacon wrapped scallops, but to have bacon be an ingredient in the mix. 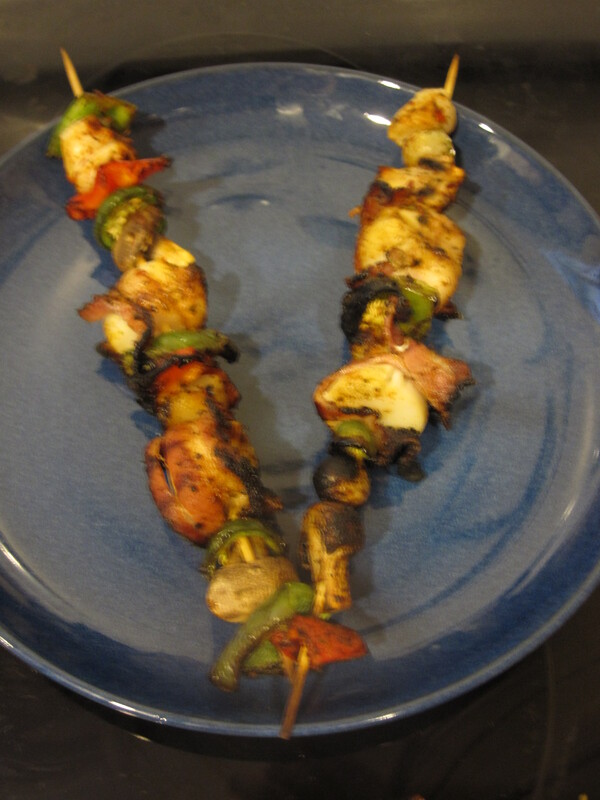 I cut the jalapenos into rings and incorporated them into the skewers because I love spice. If you were to do this, you should warn others and even be cautious yourself because as much as I love the heat it definitely got a bit hot at times! Despite that, I will always persevere with the spice! To season them, I used a storemade tequila lime seasoning from Whole Foods, which we got during our shopping trip for sushi, which was so graciously provided by Whole Foods. I grilled as you normally would and kept a close eye in order to rotate them well and try to cook them evenly, while not overcooking the scallops. I also threw a single cup of brown rice in the rice maker to supplement the skewers and for some substance. We often try to eat low to no carbs, but I knew with these skewers that they needed something with them or you would be full after eating, but then be pretty hungry in an hour or so. Just a bit of rice did a great job as a component to the dish and to fulfill the role that I wanted it to. And the completed dish with brown rice and some siracha on the side. We pulled everything off of the skewers and placed it upon the rice. As mentioned, with the jalapenos the siracha was not called upon much, though I use it on many dishes. 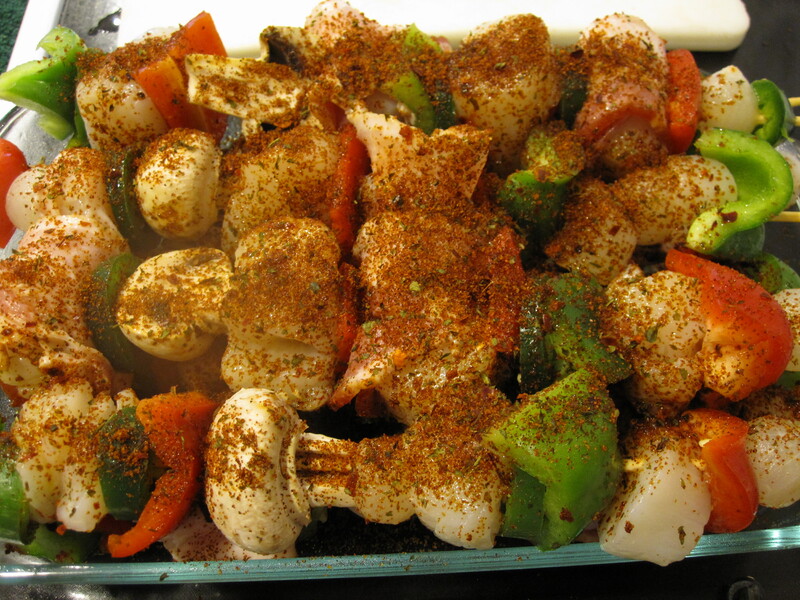 Overall, this dish was great and I recommend it as a good way to grill scallops, keep the summer cooking to the outside heat, and bring some summery grilled veggies into the mix. 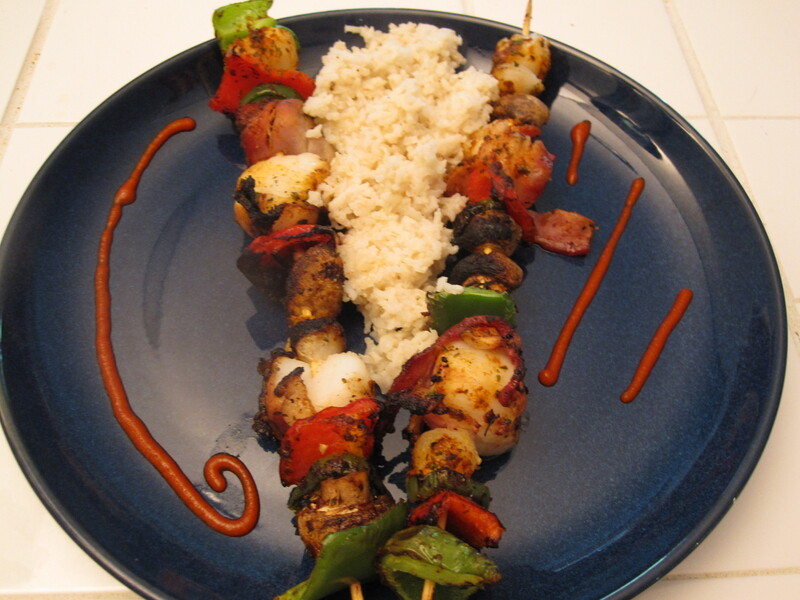 This entry was posted in Seafood, Uncategorized and tagged bacon, easy, grilled, jalapeno, scallops, seafood, skewer. Bookmark the permalink.